Matt Allen has been a fisherman for more than twenty-five years, and for someone in his early thirties, that is impressive. Matt has traveled the country for more than a decade searching for trophy-class fish in a variety of species. But, his true passion is hunting the fish that fights harder, strikes faster, and bends a rod deeper, the bass! Matt has caught 55+ bass heavier than 10 lbs on 11 different bodies of water, under all kinds of different weather conditions. Matt's largest bass to date was 17.2 lbs. (Click Here to read the story) Matt isn't like other bass-fisherman who can get stuck in a rut. He has proven that he can adapt to all types of situations and catch the 'big girls' wherever they are hiding. What makes Matt different from most fisherman, is his willingness to teach anyone to become a better fisherman. When everyone else was hiding away their tactics and strategies, Matt started Tactical Bassin'! Matt was giving anglers of all skill levels, around the world, an in-depth look at the techniques a world-class bass angler uses to catch more and bigger fish. Tim Little has been wetting a line since age 4. Growing up in the foothills of Northern California provided him with many opportunities to get out in nature and fish. Over the years, he has honed his skills and even has a 15 lb largemouth under his belt! Now, Tim has a young family of his own, and he is stoked to be able to share his passion for, and knowledge of, fishing with YOU and his family. Tim doesn't spend all day thumping them on the water like Matt (www.bassinguide.com). Instead, he works as a Warden for Fish and Game allowing him to bring a unique perspective to Tactical Bassin'. Tim gets to spend his days protecting the waters he loves and helps to ensure everyone gets to enjoy the Outdoors in all their splendor. On his days off, Tim can be seen fishing using a variety of methods, but when the bite shuts down, he breaks out the little guns. Thats right, he fishes finesse! Being Matt's tournament partner, Tim excels at producing a limit, while Matt swings for the fences. If there is one fish that really gets Tim going it has to be the spotted bass. Often more wily and difficult to pattern, the spotted bass perfectly fits Tim's methodical and thoughtful fishing style. 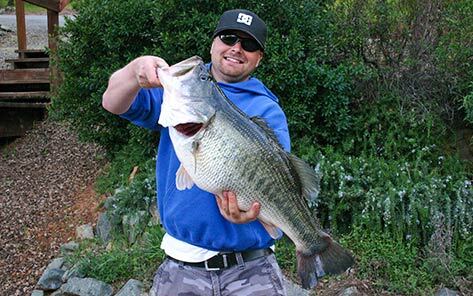 He regularly returns to the foothills he grew up in and catches giant spots in the deep waters of lakes like Shasta and Oroville. Tim is a great addition to the team and can't wait to help educate through the best fishing blog on the internet, Tactical Bassin'.